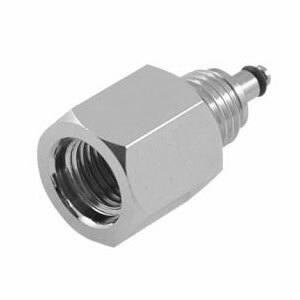 The Sonar High Pressure (HP) 7/16 inch Male to 7/16 inch Female UNF adapter with wide bore (approx 4 mm diameter) is typically used to connect a Mini tech/button SPG to a high pressure hose, instead of attaching it directly to a first stage. This adapter can be used to solve an often seen problem where a mini or button SPG with a a small HP orifice needs to be connected to a high pressure hose. It can also be used to connect two High Pressure hoses together and extend the hose length. The 7/16"-20 UNF Male end of this spacer adapter screws into a standard HP hose. The 7/16"-20 UNF Female end of this spacer adapter accepts the 7/16"-20 UNF Male end of an SPG that normally screws into a standard HP port on a first stage regulator.